Are you in A.I.D.S mode? (As If Doing Something). If your using a program that is non-work related then the fastest way to hide it from prying eyes is to minimize it. But if someone tried to sneak to your computer and open the minimized program then your busted. To avoid this embarrassing situation, use LockThis!. 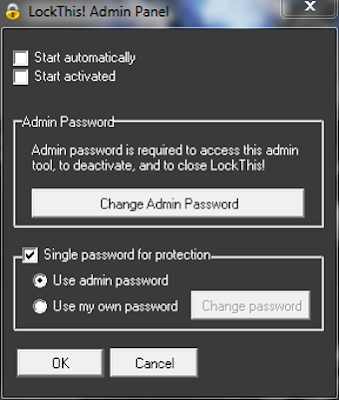 It is a free windows app that will let you easily protect any open program, so that un-minimizing it requires a password. To lock an application, you need to press CTRL while minimizing the window that you want to be protected. It will ask you for your admin password, and then keep the window minimized until you want it open again. Now whenever a user is about to restore or maximize a window, a dialog box will ask for password and if the correct password is not supplied, the restore or maximize request will be ignored and the window stays minimized.